Because when you buy one pair of jeans you get the second for $29.90. And their new flares (below) are in store in several different washes. Manhattan Mall, level 1, 33rd & 6th, and 7 West 34th Street. 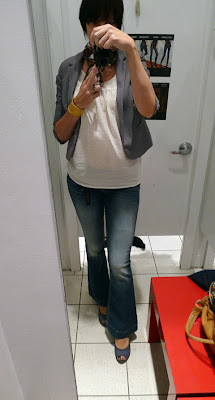 I got a pair of similar dark wash jeans from Banana Republic at an outlet for $25! Killer deal for great denim that will last a long time.